Today was a rainy,drizzly, cold day; so if I look like I’m freezing in the pictures that’s because I am. To get in the holiday season this first day of December, I wore a festive argyle sweater over a white v-neck tee. 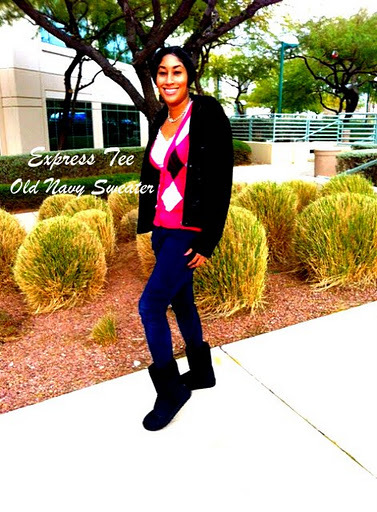 I finished the outfit with my Levi’s skinny jeans and Ugg Classic Short boots in black. yes, I realize Uggs are technically for surfers on the beach but they have gone mainstream and are super soft and cozy so I will wear them whenever and however I like. 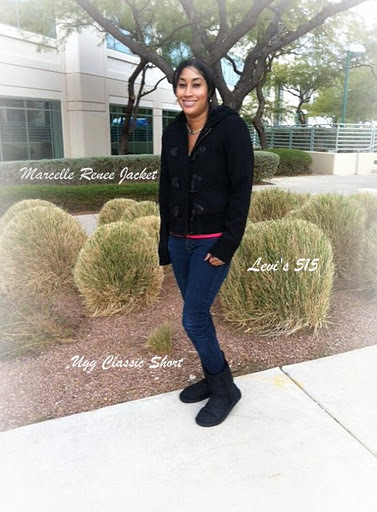 To keep warm outside, I wore a cozy black jacket with a ribbed hem and zip and toggle closures. You be cozy any way you want!